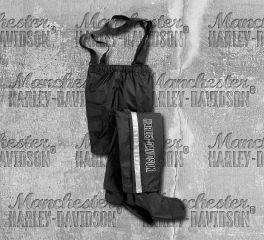 Harley-Davidson women's motorcycle rain pants are made with comfort and safety features like leg-zip openings, heat-resistant inner leg shields, and reflective materials. Oh, and did we mention they help you stay dry on a wet ride? Take cover in the women's FXRG® Rain Pant and thunderstorms have zero chance of shaming you to seek refuge at the next overpass. The breathable, waterproof construction withstands downpours and pelting rain. Added reflectivity helps riders be seen for confidence in sketchy road conditions. Easy to roll and stow (storage bag included), this women's rain gear includes trusted, foul-weather elements like sealed seams, waterproof zippers, and anti-slip seat. Stay Dry: Waterproof, breathable Schoeller® construction ensures optimal body climate. Seam-sealed interior and double seam-sealed crotch. Waterproof zippers. Hook-and-loop storm flap. Fit & Mobility: Articulated, reinforced knees. Adjustable waist tabs. Elastic and adjustable cuffs with stirrups. Gusseted crotch. Tabs for suspenders. Ride Enhancing Features: Zipper and snap-tab fly. Full-leg two-way zipper. Heat-resistant waterproof leather shield on lower legs. Reinforced knees and seat. Anti-slip seat. 3M™ Scotchlite™ Reflective Material stripes and graphics. Other Features: Storage bag included. Materials: Schoeller® four-way stretch shell is 79% nylon, 21% polyurethane. Schoeller® four-way stretch knee and seat panels are 74% polyamid, 12% polyester, 10% polyurethane, 4% elastane. Protect yourself from the rain. This Women's Black Rain Pant with Rain Gaiter will provide you with protection from the elements. It's made from 100% nylon and is waterproof.